Oh, Paris, it gets harder and harder to leave you – but tomorrow I’m headed home to my own beautiful place, with fresh memories to tide me over. But this week, I was on the hunt for new discoveries and, as always, Paris didn’t disappoint! Who knew? I packed one in my handbag mostly just because I found it while looking for my passport and decided I should try and get some use out of it. Then I arrived in Paris and found that fans are as “right now” as they’ve ever been. At the opera, in the cathedral, on the metro. Painted, tasselled, ruffled. Featuring Mona Lisa, Montparnasse and Monet. 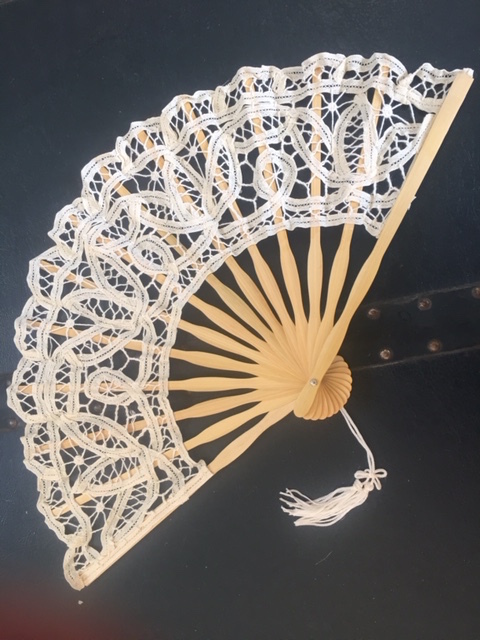 My cheapie, picked up in Hong Kong a decade ago, got a serious workout and started to fray, so I’ve updated it with this lace beauty, handmade by the artisans of Bruges. Elegant, effective, lightweight – and not just for Paris, I’ve decided! Wander along the Seine on any summer evening and you’ll have to pick your way between all the picnickers enjoying a balmy twilight with their baguettes and vin rouge. But on certain nights in certain spots you might stumble upon a more romantic way to see in the sunset! In a little boutique near Palais Garnier I found this gorgeous window full of used pointe shoes, with brief messages from their former owners. Such a simple display; so many dreams realised and, perhaps, broken. Ballet, m usic, storytelling – these were things I’d forgotten mattered, from my youngest years. Wandering through almost any arrondissement in Paris you’ll find alleys and courtyards and passages – and doors! So many beautiful doors! I could dedicate a whole blogpost to the mysterious and magical doors of Paris. I’d seen plenty of ornate passages in previous visits, but tucked away in the Marais I found this beautiful, open, airy passage filled with wonderful stores. What I loved most, though, was the trailing vines which, with the soaring glass walls and ceilings, suggested a tropical haven in the middle of this most chic of cities. Finally, emerging from the back of the Marais and its little streets of synagogues and historical libraries of ancient artifacts and quiet, shady rose gardens, I saw the temptation to end all temptations: Paris’s divine Magnum store. My photo does it no justice, so I’ve included this link so you can view the magnificence yourself. To be honest, with all the sequins and glitter and precious metals paraded in the shopfront windows, I was too intimidated to go in (and anyway, I was running a little late for a concert, which is a much more acceptable excuse for my gutlessness!). I’m not a huge fan of ice-cream, and particularly not ice cream that comes in a packet on a stick, but the window displays were drool-worthy in their own right. And so: some new favourites from Paris, off my usual beaten and beloved tracks. But that’s one of the things I love about this city – there are surprises and delights literally on every street, and it makes me somehow bigger and braver when I return to my Real Life. And that’s what I’ll do tomorrow… but now I’m off to Opera Bastille for opening night of the American Ballet Theatre’s The Sleeping Beauty – and I’ll report back on that next week, if only to keep my Paris summer magic alive a little longer!